The old operating room was located at the very top of the hospital building and patients had to be carried up and down several flights of stairs on a stretcher because there was no lift. There were complaints that the room was both badly ventilated and draughty. Gas lighting had been introduced in 1889 – initially the lamp had been put in the wrong place and had to be lowered and moved to the centre of the room, presumably to hang over the operating table. 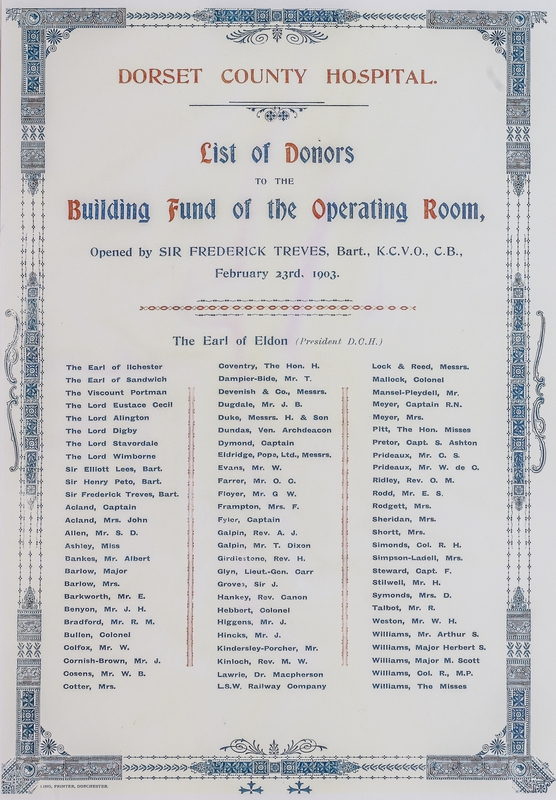 In June 1900 Sir Frederick Treves had donated a new operating table – “the best he could find”, said to cost “not less than £40” – when he returned to Dorchester to receive the freedom of the borough.